Senior CDC scientist blows the whistle acknowledging fraud. In 2013, Dr. William Thompson, senior epidemiologist at the CDC stepped forward and confessed that the pivotal study by the CDC, published in the journal of the American Association of Pediatrics (2004) entitled “Age at first measles-mumps-rubella vaccination in children with autism and school-matched control subjects: a population-based study in metropolitan Atlanta,” was manipulated, to cover-up evidence of risk, documents were destroyed. Its claimed findings were, therefore, fraudulent. 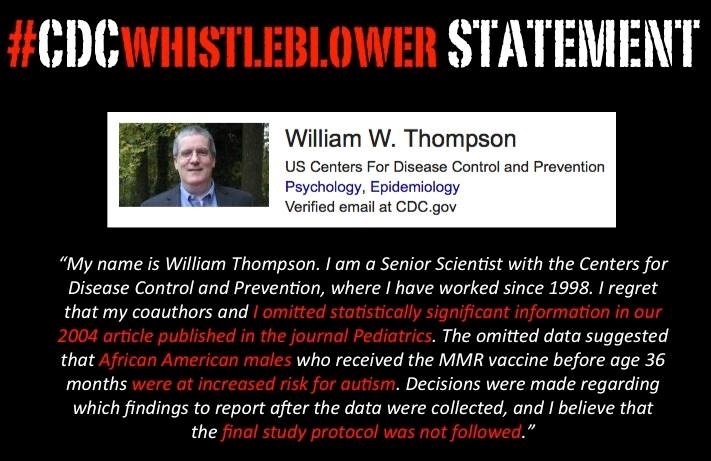 Dr. Thompson provided detailed primary evidence in 1,000 pages of CDC documents showing the agency’s scientists were engaged in vaccine research fraud with the full knowledge of highest CDC officials. CDC issued fraudulent public reports that concealed the risks the MMR vaccine posed for African American baby boys – as if Black Lives don’t matter. Thompson went on to acknowledge: “There is biological plausibility right now to say thimerosal causes autism-like features.” And he disclosed that vaccinating pregnant women with a vaccine laced with thimerosal poses “clear and present danger” to the unborn child in the form of “ticks” – involuntary repetitive motor movements or vocal sounds. CDC has recommended flu shots for pregnant women. The CDC bears responsibility for (a) concealing vaccine safety data and (b) adhering to an aggressive commercially-driven vaccination schedule, recklessly exposing vulnerable individuals whose immune systems cannot tolerate the multiple toxins in vaccines. World renowned authority on autoimmunity, Professor Yehuda Shoenfeld MD has taken seriously the “double-edged sword” of vaccines. “Vaccinations can provide an important protection from diseases like polio, rubella, measles, etc. However, there are several reports in the literature of onset of autoimmune disease within weeks or months from vaccinations.” Professor Shoenfeld is conducting serious honest research to identify the specific harm producing adjuvants in vaccines; and in devising screening mechanisms to identify those individual children at risk. As documented in our Monumental Betrayal post, the foundation upon which CDC’s vaccination schedule relies on, is fraudulent research. The research fraud described by Dr. Thompson covered up an increased risk for autism for infant African American boys who are exposed to the MMR vaccine at too early an age. A consensus seems to have taken root within the channels that disseminate medical information; including the journals and the mainstream media not to report the falsification of the vaccine research database. Thus, reports that covered up debilitating harmful effects in African American babies following MMR vaccination were broadcast only by alternative health information channels. Posted by Vera Sharav | Monday, May 2, 2016 |	Categorized Current Controversies, Corrupt Practices | Tagged MMR vaccine, Dr. William Thompson, African American children Bookmark the permalink.